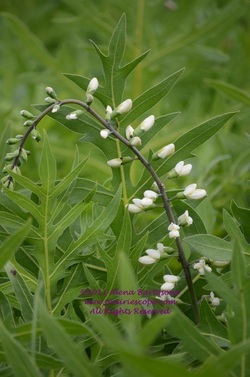 White Indigo is one of my favorite prairie wildflowers. It has an interesting structure, almost like a tree or a bush. A single large stem grows upward with 'branches' spreading wide from the stem. With a little imagination, it looks like an upside-down umbrella floating over the prairie. 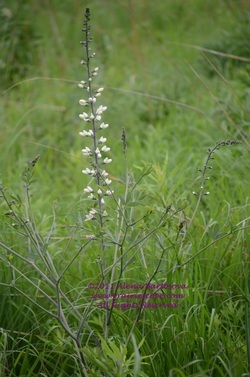 White Indigo grows 3 up to 6 feet tall depending on the site conditions. It is a perennial plant; older plants can have several off-shoots. Farmers should know it's toxic to livestock. White Indigo has compound leaves with three leaflets. The leaflets are mostly round at the top end, only slightly pointed, and more pointy at the other end where they join the stalk. The leaves, the stem, and branches often has blue, gray, or silver tint. Young white indigo prior to bloom (Meadowbrook, Urbana, IL). 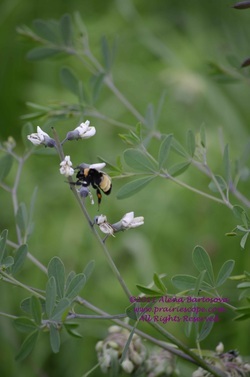 White Indigo belongs to Pea family along with clover, lupine, peas, and beans. The white flowers are typical pea flowers. Several flowers are attached to the main stem in several layers in a radial fashion, blooming from bottom to top. Flower racemes are also sometimes found at the end of side branches and offshoots. 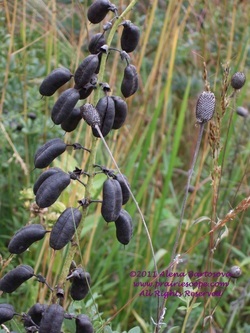 The flowers turn into large showy seed pods, first green, later turning black. Round seeds are inside the pod. They are about the size and appearance of a mustard seed.